Croydex Cabinets > Avisio Corner Mirror Bathroom Cabinet. 450x700x270mm. 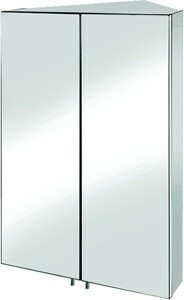 Avisio corner mirror bathroom cabinet in stainless steel with double doors. Size 450W x 700H x 270D mm. 2 x Adjustable safety glass shelves. Stainless steel with chrome pin handles. 120° hinged door for increases accessibility.